The Virtual Expertise business offer delivers a consistent, interactive experience that increases upsell/cross sell, improve expert productivity, and increases customer loyalty. 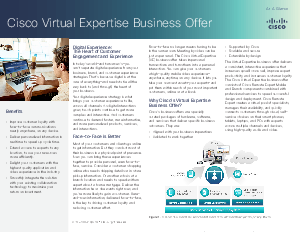 The Cisco Virtual Expertise business offer consists of Cisco Remote Expert Mobile and Branch components combined with professional services to speed successful design and deployment. Cisco Remote Expert creates a virtual pool of specialists, manages their availability, and quickly connects customers through visual, selfservice choices on their smart phones, tablets, laptops, and PCs with experts across multiple channels and devices, using high-quality audio and video.